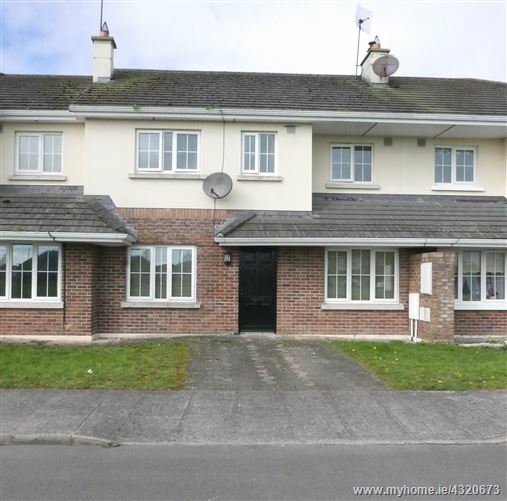 TOM MCDONALD & ASSOCIATES are delighted to offer to the market one of the Largest 3 Bed Terraced Houses in Portarlington. Accommodation of this Quality Concrete Built Home is comprised of Living Room, Kitchen/Dining Area, Study, 3 Bedrooms, En-Suite, Bathroom & W.C. Features of this Energy Efficient Home include Fitted Kitchen with Tiled Floor & Splashback, Solid Fuel Feature Fireplace in Living Room, Fully Tiled En-Suite in Main Bedroom, Separate Bath & Shower Unit in Fully Tiled Family Bathroom, French Doors leading from Dining Area to Rear Garden, Concrete Floors throughout & Cobble-lock Driveway. Overlooking a Large Green Area in the development and located just minutes walk from Town Centre, this property would make an Ideal Family Home. A Must View. Services – Mains Water, Sewerage, Electricity & Natural Gas. Living Room	- 4.69m X 2.93m. Kitchen/Dining Area	- 7.41m X 3.14m. W.C.	- 1.34m X 1.35m. Bedroom 1	- 4.59m X 2.92m. Bedroom 2	- 3.79m X 3.34m. Bathroom	- 2.57m X 2.06m. En-Suite	- 2.61m X 1.69m. - Concrete Built House with Lagan Brick Surround. - Energy Efficient Home – B3 Building Energy Rating. - Fitted Kitchen with Tiled Floor & Splashback. - French Doors leading from Dining Area to Rear Garden. - Solid Fuel Open Fireplace in Living Room. - House overlooking Large Green Area in development. - Fully Tiled En-Suite in Main Bedroom. - Separate Bath & Shower Unit in Fully Tiled Family Bathroom. - Located minutes walk from Portarlington Town Centre. - Services – Mains Water, Sewerage, Electricity & Natural Gas.